Spam mail messages have been a plague since the Internet became popular and they kept growing more and more as the number of devices and people connected grew. Despite the numerous attempts of creation of anti-spam tools, there’s still a fairly high number of unwanted messages sent every day. Luckily it seems that lately something is changing with the adoption of three (relatively) new tools which are starting to be widely used: SPF, DKIM and DMARC. Let’s have a quick look at each of these tools and what they achieve. DKIM (DomainKeys Identified Mail) should be instead considered a method to verify that the messages’ content are trustworthy, meaning that they weren’t changed from the moment the message left the initial mail server. This additional layer of trustability is achieved by an implementation of the standard public/private key signing process. Once again the owners of the domain add a DNS entry with the public DKIM key which will be used by receivers to verify that the message DKIM signature is correct, while on the sender side the server will sign the entitled mail messages with the corresponding private key. 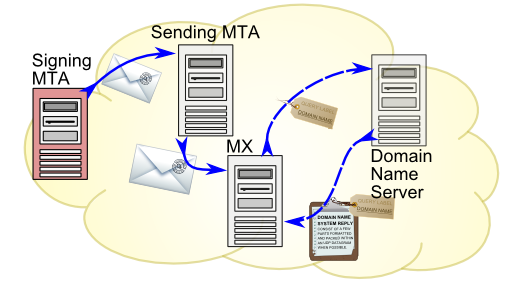 DMARC (Domain-based Message Authentication, Reporting and Conformance) empowers SPF and DKIM by stating a clear policy which should be used about both the aforementioned tools and allows to set an address which can be used to send reports about the mail messages statistics gathered by receivers against the specific domain . Unfortunately even by having a perfectly functional mail system with all the above tools enforced you won’t be 100% safe from the bad guys out there. Not all servers are using all three tools shown above. It’s enough to take a look at the table shown in Wikipedia  to see how that’s possible. DMARC can (and will) break your mail flow if you don’t set up both SPF and DKIM before changing DMARC policy to anything above “none”. What’s the message behind all this? Should I use these tools or not? The short answer is: Yes. The longer answer is that everybody should and eventually will in future, but we’re just not there yet. So even if all these tools already have a lot of power, they’re not still shining as bright as they should because of poor adoption. Hopefully things will change soon and that starts by every one of us adopting these tools as soon as possible.